The garbage ingested by this whale clogged its digestive system and caused it rupture. 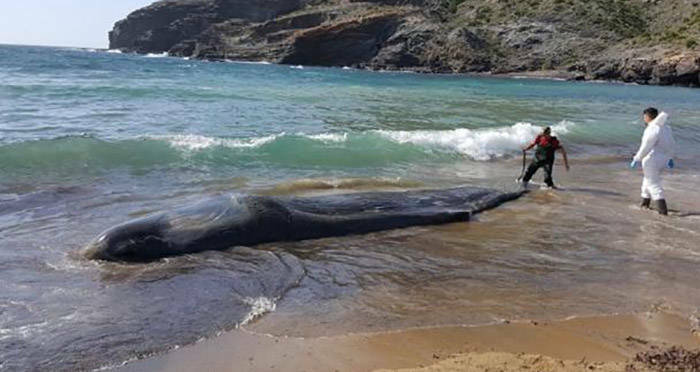 Espacios Naturales Protegidos de la Region de Murcia/TwitterThe washed up whale died of an abdominal infection due to the massive amount of plastic it ingested. A dead sperm whale that washed up on the shore of a beach in southern Spain had 64 pounds of plastic and waste in its stomach. The young whale, found on the beach of Cabo de Palos in Murcia on Feb. 27, 2018, died of an abdominal infection called Peritonitis. The infection was a direct result of the debris stuck in the whale’s stomach and intestines, which plugged the digestive system and caused it to rupture. Some of the garbage found inside the 33-foot-long whale included ropes, pieces of net, plastic bags, and other toxic debris. Sperm whales are the largest of the toothed whales (odontocetes) and are currently on the endangered species list. Plastic in our oceans has increasingly become a major health risk for both people and marine life. A 2018 report found that 70% of marine litter is non-degradable plastic. “The presence of plastic in the ocean and oceans is one of the greatest threats to the conservation of wildlife throughout the world, as many animals are trapped in the trash or ingest large quantities of plastics that end up causing their death,” said Consuelo Rosauro, Murcia’s general director of environment. What’s sad is that the story is shocking, but not surprising. The tragic fate of this whale serves as yet another reminder of this ongoing problem. It’s estimated that there are 51 trillion microplastic particles in our ocean. Fish and birds ingest those plastic particles, and we eventually eat those fish. Furthermore, at the rate of plastic entering the ocean, which is around eight million tons per year, it’s estimated that by 2050 there will be more plastic than fish in the world’s oceans. Combating this issue revolves around prevention measures, introducing new biodegradable plastics, and spreading public awareness through marine protection campaigns. The discovery of the whale motivated authorities in Murcia to launch a beach clean-up and awareness campaign. “The region of Murcia is no stranger to this problem, which we must tackle through clean-up actions and, above all, citizen awareness,” said Rosauro. If you found this interesting, you may also want to read about the study that found people have made enough plastic to cover Argentina. Then read about sea turtle that died after vets surgically removed 1,000 coins from its stomach.